In this post, we explain the legal situation for the use of drones in Ghana. From September 2016, all Copter owners in Ghana have to register their equipment. The registration must be renewed annually. Those who do not own a drone or want to import it into the country need the approval of the Civil Aviation Authority. Before you travel to Ghana, you should contact the CAA. Unregistered pilots can go to jail for up to 30 years. Maximum altitude: In Ghana, the drone height limit is 121 meters (400 feet) above ground. Maximum horizontal distance and FPV: Private drone flights must only be within the direct line of sight unless a special permit has been granted. To obtain these approvals, you must meet the requirements for commercial activities. If a person next to you is observing your drone flight as a spotter, that person must also prove their own skills at the CAA. Compulsory insurance: In Ghana drones are only approved if you have Ghana valid drone insurance. The different terms for the categories can be understood in the PDF linked below. Distance to airports: To airports and helipads a lateral distance of 10 kilometers must be observed. Operating times: Night flights with a drone are only allowed in Ghana with a release from the CAA. Special legislation: For FPV-Races a special permit has to be requested at least 30 days in advance. Commercial Pilot Regulations: Commercial drone controllers require an RPAS Operating Certificate (ROC) issued by the CAA. You can not apply for the ROC if you are younger than 18 years. During commercial flights, you will need a Safety Management System (SMS) and an Emergency Response Plan. All commercial pilots also have to maintain further documentation in Ghana, such as a logbook and qualifications. Good to know: The provisions mentioned here do not apply to the use of drones inside buildings. Failure to comply with the regulations can result in massive prison sentences. 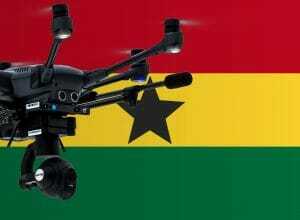 We have researched the listed drone regulations for Ghana to the best of our knowledge. We cannot guarantee the correctness of the information. If you want to be on the safe side, contact the competent aviation authority. Alternatively, you can also ask the embassy in your country for further information about the regulations. Please leave us a comment when you receive news and/or gain experience with your copter in Ghana! How did things go for you? Any information to share on how to prepare or ways to get permission? I’m off to Ghana in 2 months, just ordered my first drone and looking forward at the opportunity to fly. I’m aware that i need to register for a RPAS license, but can’t find any information on where to find the documentation. At the moment, I do not have more information. As soon as I get a deeper insight, I’ll share the news here. Sorry that I cannot help you further. In the meanwhile, you can reach out to the CAA of Ghana. Yes, absolutely. I would not risk being arrested. It’s a pity! We operate Dji Inspire and Matrice. Congratulations! Let us know how the rest of the process went, please. Next time I will borrow my Mavic PRO to aborigine friend and that´s it …. It could be. I would not risk it anyway.